Just a few days ago I pointed out that many of classical music’s current problems can be attributed to futile attempts to herd minority interest groups spread across many small niches into a single mass market. And now classical music has done it again with the newly launched Sinfini Music website which is bankrolled by Universal Music, although the site itself doesn't tell you that. Universal's classical labels, of course, include Deutsche Grammophon and Decca, and the group distributes ECM releases in many major markets. 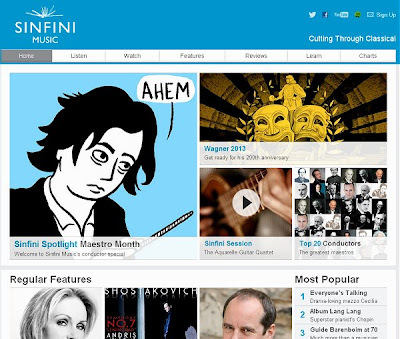 As can be seen from the accompanying examples, Sinfini Music is a product of the ‘condescending classics’ school of marketing pioneered by producers at BBC Radio 3, and by editors at the Gramophone and at the defunct Classic FM Magazine - the latter publication, incidentally, spawned Sinfini. They have all adopted the ‘condescending classics’ approach in their attempts to create a mass market, and, as independent audience data proves, they have all failed dismally. There is little point in questioning the editorial independence of a website that claims to be "run by a team of music" fans, but which is in fact managed, owned and funded by a major record company, or deploring the self-interested promotion of the site by certain music bloggers. There is little point because Sinfini will soon become a victim of its own hubris. Classical music is not about corporate condescension. It about inspiration, aspiration, independence, diversity, innovation, passion, and, yes, honesty. If you are still not convinced, read how the corporately condescending Gramophone’ lost two-thirds of its print circulation and failed to gain any traction as an online publication. But haven't you heard? Classical music media will never look the same again . Yes Andrew, and someone else is saying Sinfini Music will end you. I think the irony might be lost on at least one of those bloggers. I thought the same thing when first clicking around the site. "Oh boy! Another classical site that brings no decent classical reporting, no context to music of the past or of our time, and no interviews or discussion of musicians of interest! Sign me up!" Beware, the sharks are circling in the deep end of the pool. And you can believe me, I work in academia.